Suzuki Gixxer. Two jungles in the background. King of the one. How can choice be a bad thing? A good motorcycle never makes a segment overcrowded. It makes it better. And "good" is just an understatement for the Gixxer. It is very good. It is quite brilliant actually. Suzuki hasn't had a very good run with their motorcycles in India for a long time now. Their motorcycles in 100cc and 125cc segments haven't really set the sales charts on fire and the company didn't laugh their way to the bank. The GS150R, Suzuki's answer to Honda's Unicorn, and one of the best motorcycles in the 150cc category, also fell flat in the face of competition and hardly brought any success to Suzuki. 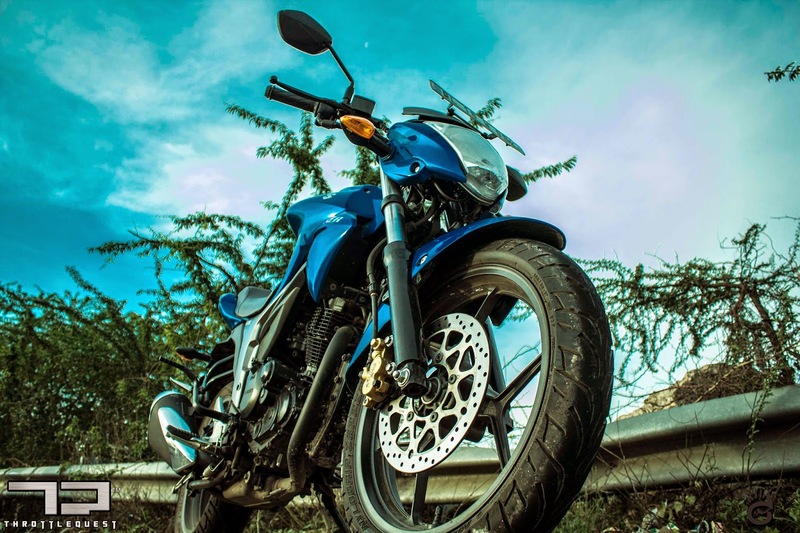 It is an extremely practical and the only commuter motorcycle up to 150cc that comes with 6 gears. So what has been wrong with the Japanese manufacturer? Is it the lack of appropriate marketing and awareness in public about their motorcycles? Probably yes, at least when it comes to the GS150R, but what about the Hayates and the Slingshots? They probably came too late to the party when the country had already been imprinted with varieties of millions of Hero Splendors already rolling around. But then again, it's Suzuki, the makers of the Shogun, the GSXRs and one of the most important and successful motorcycles in the history, the Hayabusa. So it's about time that Suzuki get its act together in India. If they are here to stay and not just looking to sell some high end motorcycles, they must take the 150cc segment seriously. Why 150cc? Because it's like the best of both worlds - volume and niche. If you're smart enough, you can make one motorcycle that attracts a normal consumer looking for a stylish and decently powerful motorcycle while also serving enthusiasts who are tight on budget and looking for a performance oriented 150cc bike. While the segment had a fantastic start with the Hero Honda CBZ followed by the Bajaj Pulsar and Honda's fantastic Unicorn, it has since moved on to the Yamaha R15s, FZ-16s and the CBR150Rs. 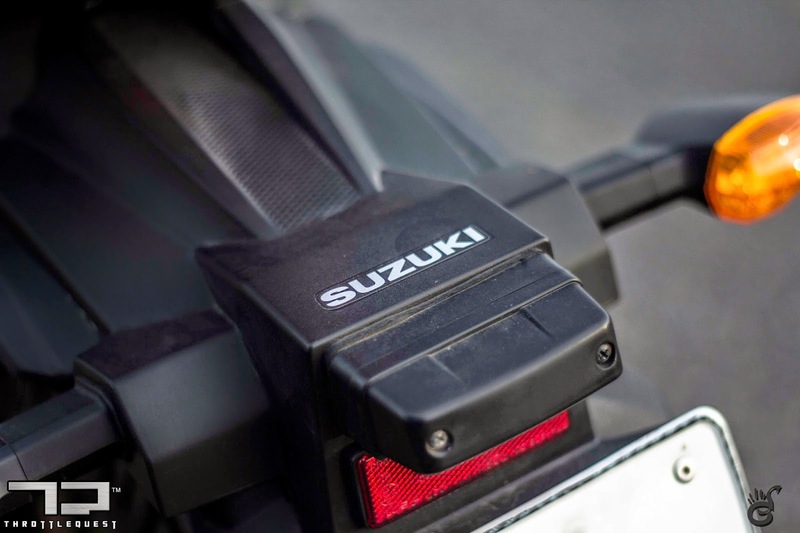 What this means is that Suzuki needs more than just a GS150R to turn window shoppers into potential customers. Even the ultra smooth engine with 6 gears for cruising comfortably at 100kph don't make for an impressive spec-sheet unless you are reinventing the product itself. But then, it's a big risk to take an unsuccessful motorcycle (no matter how good the GS150R is otherwise) and relaunch it as a new product and hope for the fortunes to turn around. So what did Suzuki do to counter this? They developed the Gixxer. The name that would change things for Suzuki... for good! Last year in Auto Expo, held in the outskirts of Delhi, Suzuki unveiled an all new 150cc motorcycle, Gixxer. 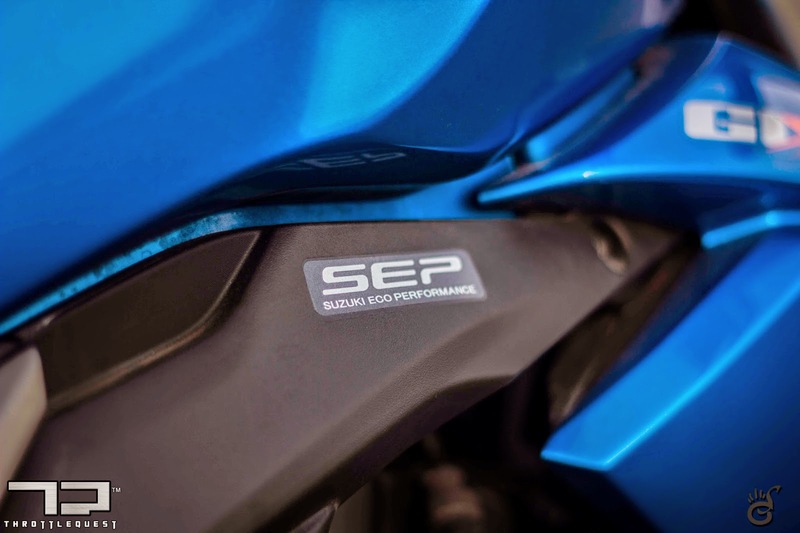 I initially thought that it might be a sportier incarnation of the GS150R, but one look at the engine ensured that it had no relation with its commuter sibling. The only matching point between them is the segment they are in. So an all-new 150cc Suzuki, that's a start! Initial reactions were good, the motorcycle was striking to look at in the blue color and one of the highlights of the design was the exhaust system. It had two outlets instead of typical one. After all, it's a single cylinder motorcycle, so what is the need of two outlets in the exhaust? Let it not be just a visual element, we hoped. The design looked fresh and had the Suzuki style statement all over it. This time, Suzuki seemed more motivated than before, confident and intent on being more than just another player in the market. Everything appeared positive. Then we waited for the motorcycle to hit showrooms. Since then, things have been looking up for Suzuki. 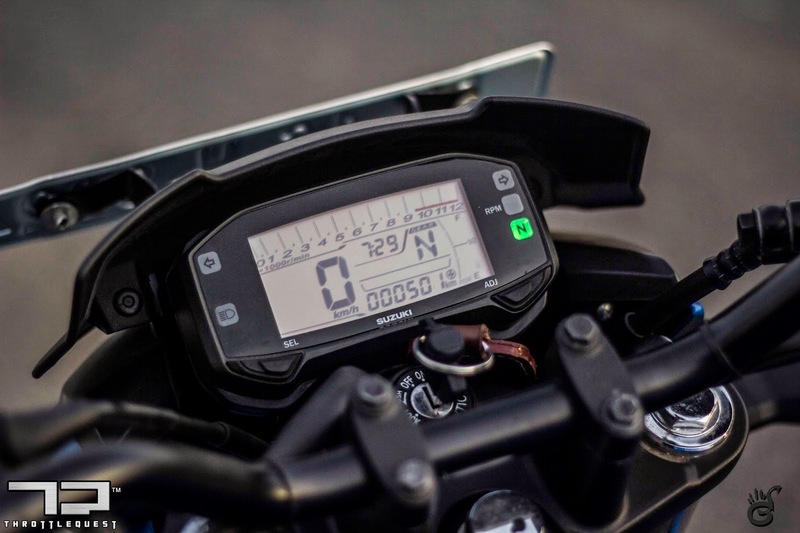 People started talking about the Gixxer; Indian websites and forums had something new to discuss about and it could be the one to challenge the fantastic Yamaha FZ-16. People looking for a stylish, comfortable and inexpensive 150cc motorcycle got something new to choose. In March this year, we got the chance to ride it. 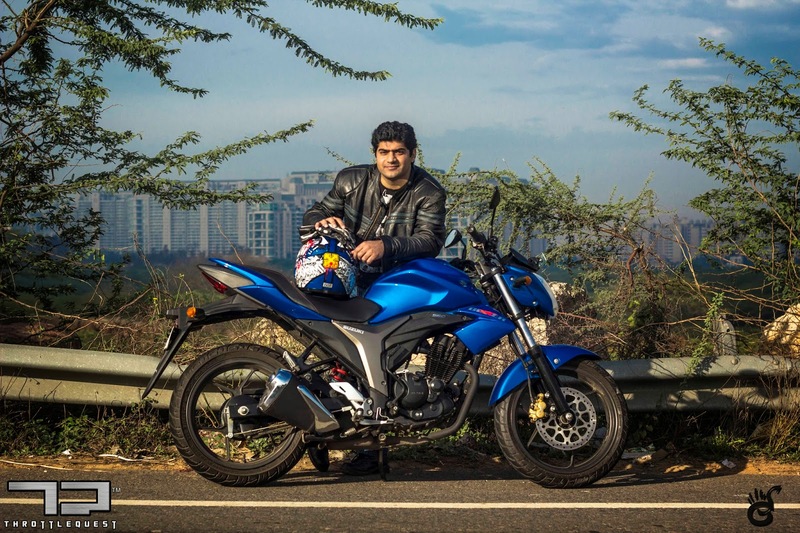 The Gixxer is handsome looking and looks like it's going to be fun to ride. Why? Because it's compact, light and figures are good enough to take on the rivals. Secondly, it has a Suzuki design element all over it, especially the fuel tank which has the familiarity of the ones present on its bigger motorcycles. Particularly in blue color, the Gixxer does look like the youngest brother of the newly unveiled naked street-fighter GSX-S1000. However, I felt that the tank shrouds could have been designed better. The build quality and the fit 'n' finish of all parts look good. The meter console is well designed and has all the information very neatly displayed. The text is legible to read under any lighting conditions. Other than the typical information, the meter console also has two trip meters (A and B), displays the current gear and also has an RPM indicator light which blinks indicating it's time to upshift. This is rider configurable. 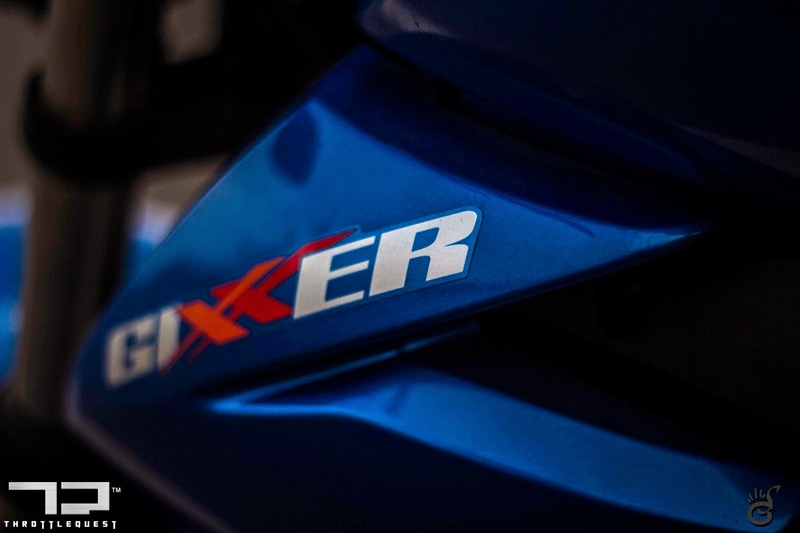 The name Gixxer is labelled on both tank extensions. The handlebar is single piece, finished in black and has a flatter design (like in FZ). 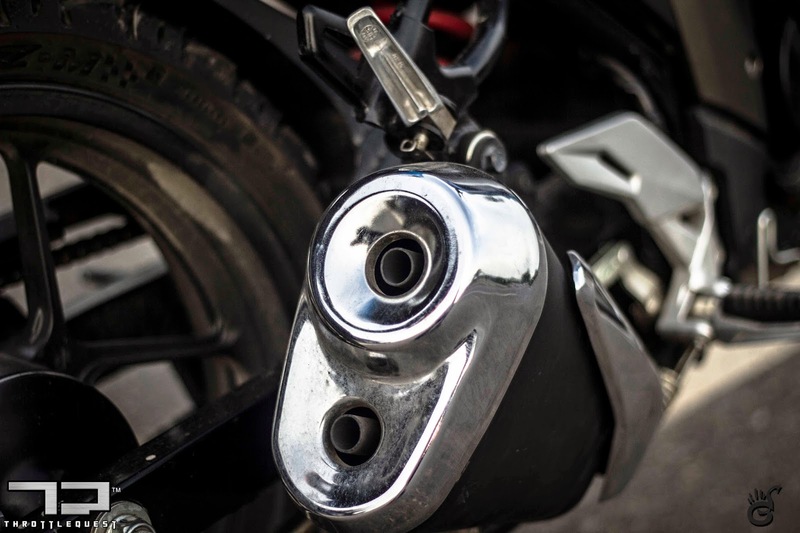 The exhaust with two outlets not only looks impressive, but primarily has functional purpose as well which is improving the exhaust efficiency. 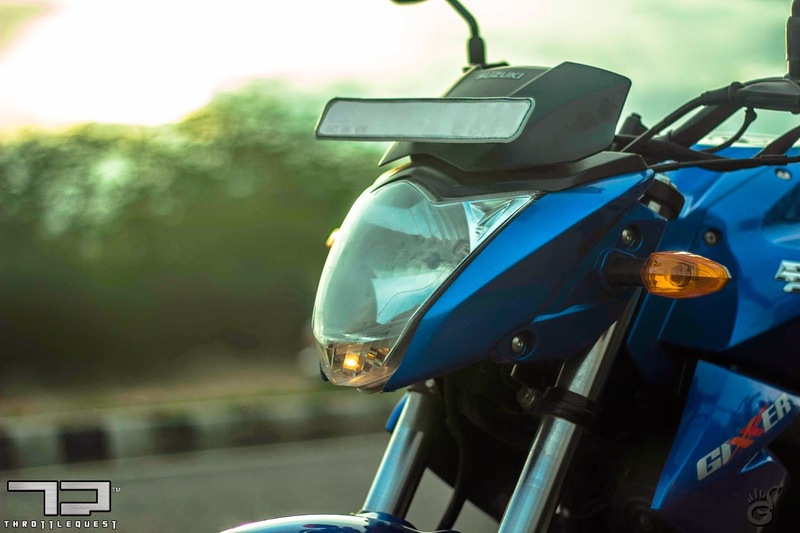 Finally, the LED tail light looks beautiful too and is one of the recognizable elements of the Gixxer. The exhaust generates a typical 150cc single cylinder sound when in neutral. But wait till you ride the motorcycle and especially in high rpm range close to its redline. The Gixxer has one of the best exhaust notes in its segment. In my experience, Honda's CBR150R is the only other 150cc motorcycle which sounds extremely good when screaming. So for me, it's alright to say that Gixxer's exhaust note is probably the best in its category. The riding position on the motorcycle is comfortable while being a bit aggressive which is nice and highlights the motorcycle's sportier character. The handlebar is wide enough to feel comfortable and provides great control in handling the bike. One of the highlights of the riding experience and the sitting position is the seat. It's a single seat design for the rider and the pillion. When riding, it feels that the seat has more room for the rider to move around a bit than it looks. I was pleasantly surprised to observe this. Not once, even with a pillion, did I have to rest against the fuel tank to support myself. In fact, I never got to touch the tank as much as I can remember. This is fantastic. Also, the cushioning is a bit hard to sit on but it always felt good. I recon the slightly hard cushioning would feel better on a long ride as well. Overall, the seat is one of the high points (and there are lots of them) in this motorcycle. The ride quality and comfort is one of the best as well. 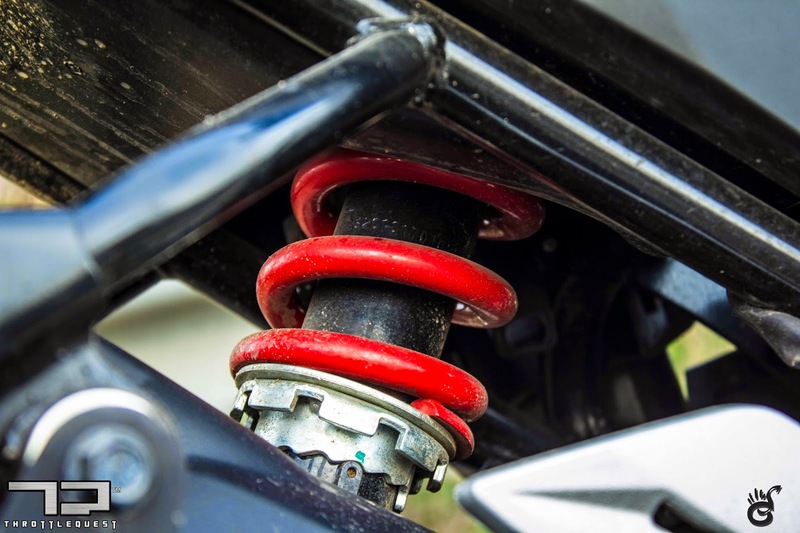 The rear mono-shock is 7 step adjustable; however, in the factory setting the suspension felt ideal for daily rides. In my locality (where I live), a particular stretch of a street is made up of brick stones and they are mostly put together in an uneven fashion (more or less like a broken tarmac). On that street, in second gear, I could move ahead quite comfortably without feeling any unsettling jitters. 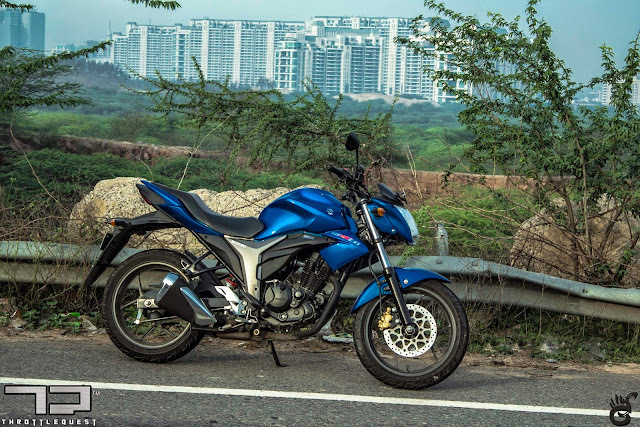 On smooth roads, the Gixxer understandably felt like gliding rather than riding. 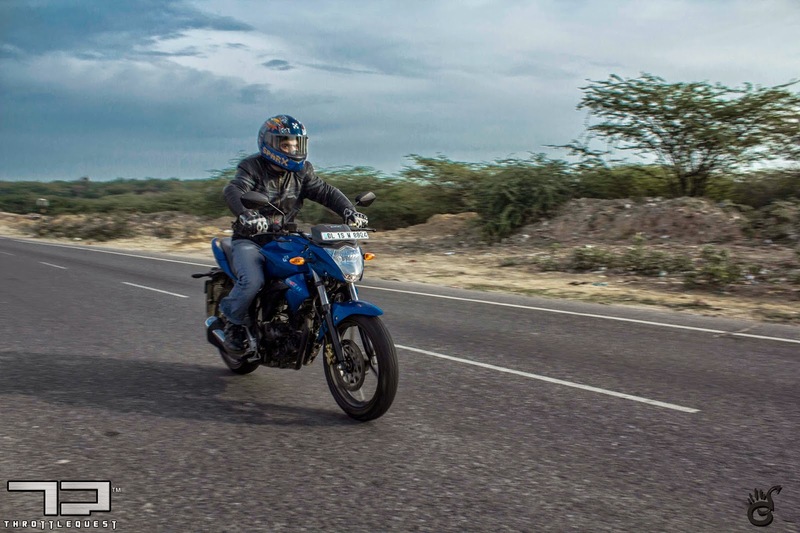 Another point about the factory suspension setting on the rear shocker is that it never bottomed out even with a pillion on varied road conditions and the ride remained smooth and comfortable throughout. However, the best is yet to come. The Performance. The engine performance is quite fantastic for an air-cooled engine with Single Overhead Cam and 2 valves. First, the engine is breathtakingly smooth and it gets smoother as the revs climb up in any gear. In neutral, there's a pulsing sensation from the engine that can be felt and it's not the vibrations. That pulsing sensation gives a profound feeling of the working piston inside the cylinder head which eventually starts to disappear as the motorcycles moves faster highlighting the smoothness. All such states of the engine are matched perfectly with the sound it generates from the eye-catching exhaust. The gentle purr in neutral changes to a very slightly bassy rhythm as soon as the motorcycle moves. With each gaining rev, the exhaust note continues to turn into an ear-pleasing scream. Close to the redline it sounds best, and it sounds equally good when indulging in some engine braking. In this situation, the intake growl is as nice as the scream of high RPMs. This is all with respect to single cylinder motorcycles. For some literature, the engine generates power of 14.8PS @ 8000RPM and torque of 14NM @ 6000RPM. The piston has a skirt with an inverted triangle shape, which is Suzuki's first in their sub-250cc motorcycles. What this means, in simple terms, is that there are extremely less mechanical losses which eventually contributes to the performance on the road. 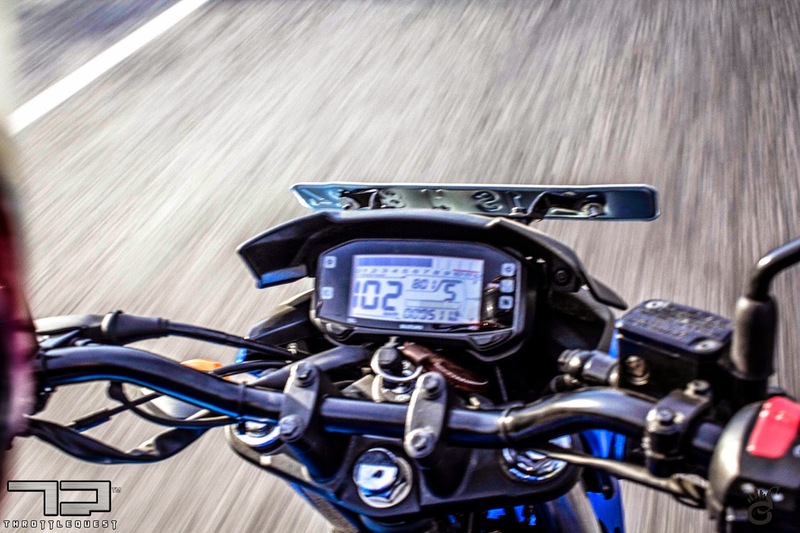 All this, combined with the 135kgs of ready-to-ride weight, means that the Gixxer is quite possibly the best performer among the sportier-commuter motorcycles. The frame (or chassis) is a single downtube diamond type design. The combination of the chassis, suspension and low weight is so good and apparent while riding the motorcycle, more so when riding enthusiastically. The maneuverability is effortless and keeps the ride stress free in traffic. The stability at all speeds that the Gixxer is capable of is solid. I believe that the true top speed would be anywhere between 110kph and 120kph. The stability of the motorcycle even at the top-end was absolutely impressive and there was not even a single nervous moment as far as this is concerned. 102kph, top gear, 7500RPM, with a pillion, sitting upright! Riding solo, and this is important, I was able to cruise at 100kph quite effortlessly and sitting upright. At that speed, the engine is running at 7000RPM or so and was quite stress-free and even with regular bursts to such high speeds and more, there were no signs of stress on the engine. Post 90kph, the exhaust note starts to turn into a howl and it gets better and better. What is more impressive is the bike didn't struggle to reach the triple digit speeds. 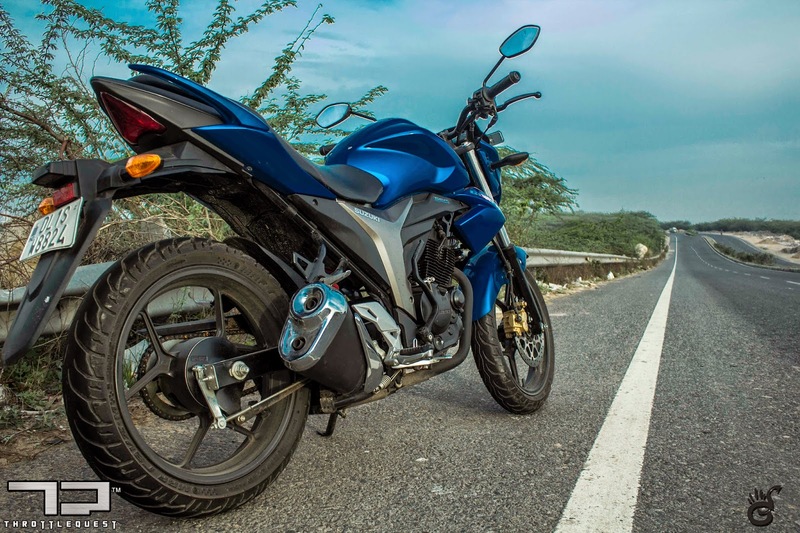 Particularly this has been the Achilles heel of almost all other sportier-commuter 150cc motorcycles. 118-119kph was the maximum I saw on the speedo, which I believe is very satisfying for a motorcycle like the Gixxer. Even with a pillion of around 55kgs, I was able to reach speeds somewhere between 110-115kph. Again, that is brilliant. This engine is quite a gem. Braking performance was satisfactory as well. The feedback from the front disc was quite spot on and the stopping power felt progressive. The rear drum brake complemented nicely and didn't lock up unnecessarily whenever applied. Effortless, easy, stress free, stable and confidence inspiring are all the adjectives that can be used to describe the handling capabilities of the Gixxer. These traits continue when the motorcycle is leaned into a corner. And you can manage some good lean angles on this motorcycle. Even with a pillion, the handling dynamics of the Gixxer remained more or less the same, which is saying something. For half of my time on the Gixxer, I was accompanied by a pillion. At the first sight itself, she liked the way the bike has been designed. I am glad to say that at the end of it all she wasn't oblivious to the bike's performance either. That's good. Also, I got thumbs up for the pillion seat and was told that it was comfortable and more accommodating than our FZ. And finally, the exhaust note got a separate mention as well. Good enough responses. In the end, I have been left extremely impressed by the Suzuki Gixxer, more than I had expected to be honest. It has impressed me when I have looked at it and it has impressed me when I have ridden it. I didn't concentrate on its fuel efficiency but given the performance, it seems to be that it sips fuel than gulp it. That is good enough to know I guess. The Gixxer costs 84000Rs on-road in Delhi and we are starting to see it on the road quite regularly which means the motorcycle has got a good start. Suzuki has made a fantastic motorcycle and if they can take care of after sales service, then they have given sleepless nights to their competitors. I would take it in blue. We would like to Thank Suzuki India for providing us with this motorcycle and partnering us for this review. Excellent review sir. Covered all important aspects. The doubts I had about the monoshock has been thoroughly cleared by the reviewer. Thanks a ton.